Roksana is currently our only breeding cat at home. She was born from the last litter of Aino with a very special boy that we imported from Russia and grew to love very much, Amulet. It was planned ever since the mating that we would keep a pretty girl from the combination. And we did. 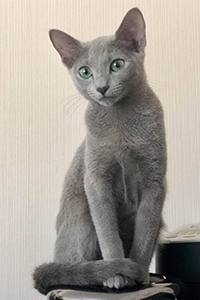 She's definitely pretty and lighter than her mum in coat but she also has a lovely and curious personality - she loves to make contact with us! She also has a very nice profile. Eye colour is still in development. Roksana had her first litter with Hana-Bi Tähtipölyä, and the next one is planned for early 2020 with Starstruck's Xavier. I am the girl selected to continue the family tree after my dad Emil and my mom Roksana. I am a curious little girl whose favourite hobby is to attack my big sisters when they're in the litter box. The food on their and my hoomins' plates tastes so much better so I am always trying have a little snip or bite on whatever they're having. 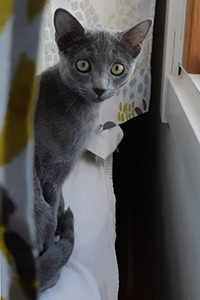 My breeder says I am very lovely blue Scandinavian girl but she'd like me to have greener eyes. Then she might be able to drop my current pet name, "yellow eyes". Alina is my new breeding female from Viivi, the Harmuan breeder. 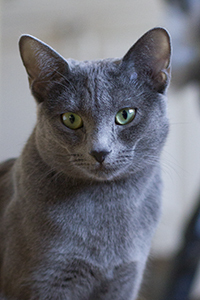 She lives in Pori with two “big brothers”, Russian Blue boys Maksim and Nikita, and her humans. Alina has a very balanced look and a really promising eye colour. Alina has nice expression and good profile. She will also most likely have very nice green eyes. She’s not afraid of anything! Alina and Tamos got a litter of 3 kittens together. One of the kittens will continue in breeding after his parents. Helmi like her siblings all have wonderful temperament. Helmi was perhaps the most lively and active kitten of the litter of 3. She lives in Vuosaari in a family of daddy, 3 kids and a new friend Starstruck's What's Up Wawanosh. Helmi has wonderful coat, profile and ear set. The eye colour is slowly developing towards green. Helmi is planned to have a litter with Wawanosh in 2019. Vela is from a litter of 5 kittens and lives in a leasing home in Lahti with Anna and Ida. Her pet name is Fanni. Vela has a nice profile and wonderful plushy and soft coat into which you just want to sink your fingers. However, the best thing about her is definitely her personality - she simply loves us humans! Vela is planned to have kittens in early 2020.